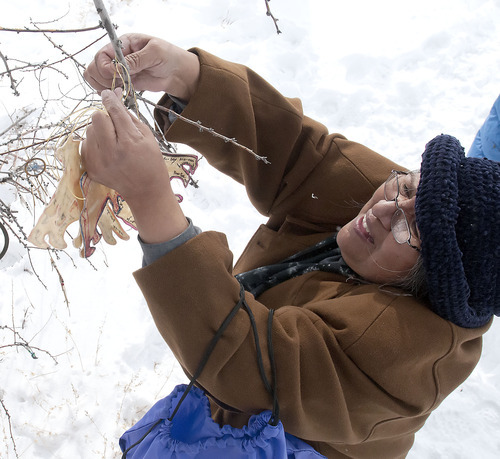 Identities of the 40 Shoshone who were among the victims in 1863 were discovered recently. Preston, Idaho • For more than a century, the hundreds of men, women and children slaughtered along the Bear River were remembered as anonymous Indians, their names known only to their closest kin, now long dead. 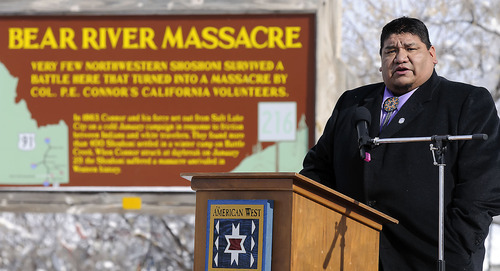 That changed Tuesday, when, for the first time, the names of 40 Shoshone likely killed in the Jan. 29, 1863, Bear River Massacre were read aloud. "Anno-tz-do-bey. Tabby-Woot-te-gwa. Co-ro-boits-e," read 11-year-old Brooklyn Timbimboo, who joined her grandmother, Patty Timbimboo-Madsen, in reading the recently discovered names of some of those presumed killed that January day, 150 years ago. Members of the Northwestern Band of the Shoshone, headquartered in Brigham City, gather every year at the historical marker, three miles northwest of Preston on U.S. 91, to remember the deadliest of American Indian battles. It was at Bear River that hundreds of Shoshone  estimates range from 300 to 500  were stabbed, shot and clubbed to death by the U.S. Army&apos;s 3rd California Volunteers intent on punishing Indians for interfering with mining supply wagons and pioneers. The soldiers had ridden north from Fort Douglas in Salt Lake City for the dawn attack. Few of the victims&apos; names survived in the largely oral tradition of the Shoshone. But on Tuesday, the sesquicentennial, more than 200 who braved treacherous roads from as far as Boise, Idaho, and Salt Lake City heard names of the dead. Snow fell even as the sky cleared and sun shone on those bundled up against the cold. Two fire pits provided warmth and smoke from sage bundles was used for "smudging" to cleanse the spirit. "It&apos;s oddly appropriate for us to be a bit uncomfortable," said historian Scott Christensen, who wrote a biography of Sagwitch, the only chief to survive the massacre. Two eagles  one of them clearly a golden eagle  circled the nearby killing field during the ceremony. Jason Walker, chairman of the tribe, also announced that two bodies of young Shoshone killed at Bear River, a 15- or 16-year-old boy and girl, were recently returned to the tribe from the Smithsonian Institution in Washington, D.C.
Darren Parry, vice chairman of the tribe, brought their remains home earlier this month, and those will be buried in the spring, along with the remains of a third Shoshone from the 1300s, whose body was found in western Weber County. Parry said it&apos;s not clear to him how the Smithsonian came to own the bodies. The tribe had been trying to gain custody for a decade, he said. Representing the governors of Utah and Idaho Tuesday were Utah Lt. Gov. Greg Bell and Janet Gallimore, executive director of the Idaho State Historical Society. Bell praised the Shoshone "for moving forward without forgetting the past," and Gallimore placed the massacre in the historical context of the Civil War, before state boundaries were drawn in this part of what was then Washington Territory. Those who perished, she said, "in many ways are still with us, and this land will never forget." Cache Valley&apos;s Mormon pioneers had a mixed reaction to the carnage, Christensen said. Some cheered the Army&apos;s victory as "intervention of the Almighty," while others who walked the bloody ground the afternoon of the massacre were sickened and horrified. Christensen works for The Church of Jesus Christ of Latter-day Saints&apos; history department, and it was in church archives that 40 names of possible massacre victims were discovered earlier this month. A service missionary from Mendon, Paula Watkins, was helping prepare temple records from the old Washakie ward to be copied for the tribe. Sagwitch and 300 other Shoshone converted to the LDS Church a decade after the massacre, and were eventually settled south of Malad at Washakie. Watkins noticed  and called to Christensen&apos;s attention  that many death dates of those listed for proxy baptisms were in 1863. Two of them, Tos-so-a and Pag-e-yah, were listed as dying on Jan. 29, 1863  clearly massacre victims. Watkins said she was moved to learn that the Shoshone who died at Bear River hailed from throughout the region, from Nevada to Wyoming to Idaho to Utah. They were all gathered at the Bear River, which has hot springs, for the Warm Dance to hurry along the spring. "It&apos;s time we not only name people but that history becomes more personal," said Watkins. "That&apos;s what names do." Among those at Tuesday&apos;s ceremony were descendants of one of the Army soldiers, Ricky Jones and his son, Ryan Jones, who traveled from Tulsa, Okla.
Ricky Jones&apos; great-great grandfather was shot in the elbow and the hip in the first wave of the fight, Jones said. His best friend, a fellow soldier, died at Bear River. 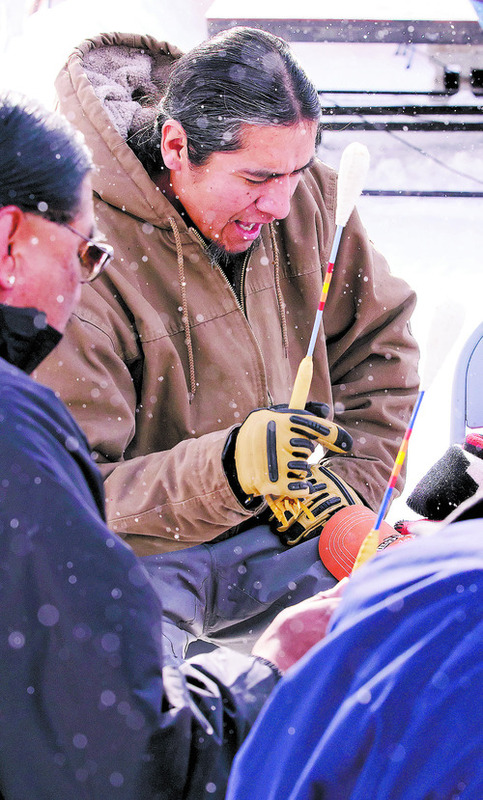 Jones, who grew up hearing "the white man&apos;s" version of the story, says he has learned much by becoming friends with Timbimboo-Madsen, the tribe&apos;s cultural affairs officer. "Battle," he said Tuesday, "is not a good thing."